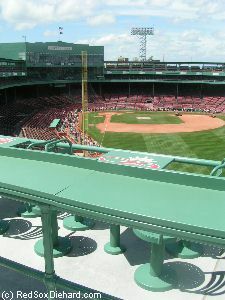 This picture was taken from the back of the right field roof standing room space, looking down at the Big Concourse area inside Gate B. Fans are lined up outside the gate, near the Ted Williams statue. After a little while, stadium workers started setting up chairs in the seating area on the roof, getting ready for a wedding that was taking place later that afternoon. 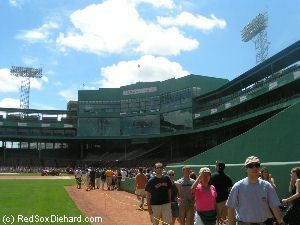 Next we walked around the warning track, starting in the direction of the Green Monster. Unfortunately we weren't able to touch the scoreboard or peek inside like I had done on Father's Day, because it was roped off. The graffiti I had seen then had been painted over, but those reponsible for it had ruined the experience for everyone else. We went around to the visitors' dugout. There's a door at the end of the dugout that was ajar, and the people ahead of me had looked in, laughed, and then closed it again. 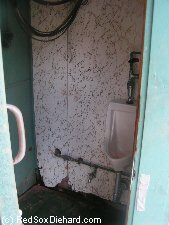 I thought there was a bathroom at the end of the dugout, but I was curious, so I peeked inside. Sure enough it was a closet-sized room with just a urinal in the corner. 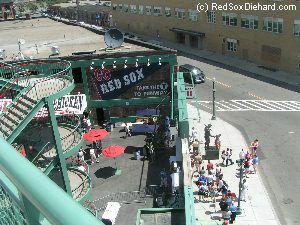 It was certainly a part of Fenway I've never seen before! Being the fan of Fenway that I am, and since I have a digital camera so I wasn't wasting real film, I naturally had to take a picture before closing the door. I sat on the dugout bench, as the people who came behind me wondered what the Kodak moment had been. It was funny seeing everyone's faces when they opened the door and discovered what was inside! Next it was on to the home dugout, where everyone wanted to try out the phone. We didn't need to dial anything; it started ringing as soon as we picked it up. That was another photo-op, and then it was back onto the warning track and around to right field. When we walked past the bullpens, the doors were roped off so we couldn't go in. But we could hear the phones ringing off the hook from all the people trying them out in the dugouts! Before leaving, we spent a little time in the Big Concourse under the right field stands, and then we left to drive home. This page and all photos copyright © 2004-2005 by Kristen D. Cornette.